Barça will play five friendly games between 24 July and 11 August as Tito Vilanova gets his team ready for the new season. The team will also take part in the Catalan Super Cup in July and this year’s Joan Gamper Trophy will be held on 20 August. 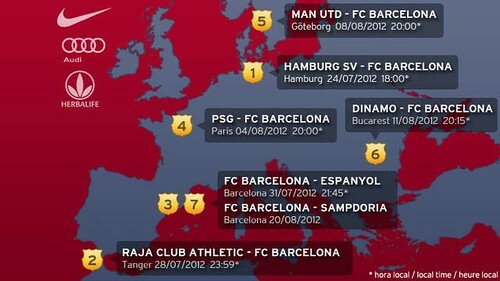 Buy Barcelona tickets for preseason matches ? The details of the team’s final summer friendly were revealed on Friday and Tito Villanova will have five pre-season friendlies between 24 July and 11 August, ahead of the La Liga kick off on the weekend of 18/19 August- The five games will be played in five different countries as the new coach works on his plans for the 2012/13 campaign. Parc dels Prínceps, Paris (France). Le Trophée de Paris. As well as the five pre-season friendlies, Barça will also take part in the first edition of the Catalan Super Cup, on 31 July (21.45) against Espanyol in Montjuic. The Gamper Trophy will see Barça face their Wembley ’92 opponents, Sampdoria to mark the 20th anniversary of that game and will be held on 20 August, just after the first La Liga game.